I’m really excited about today’s Simply Solo Spotlights to celebrate Valentine’s Day. You heard me right, spotlights, plural. Here I’ve compiled valentines from some of my favorite bloggers and friends on Twitter. I hope you enjoy, and please visit each of their sites to read more of their writing! Happy Valentine’s Day! Quick shameless plug: Do you have a story to tell? Advice to offer? Did you just have literally the worst date of your life and you must write about it? I’d love to have you as the next Simply Solo Spotlight! Contact me at: simplysoloblog@gmail.com. Listen, I know I say I love you every day. And I try to never make it routine, or habitual or taken for granted. Since the first day, having you in my life has changed me, all the way to the core. I am kinder. More patient. More forgiving. You took a man who was inherently quite selfish, and made him think first of you. Just by being you. That’s no small accomplishment. And it’s a gift for which I can never repay you. I admire your mind, and am fascinated by the way it works. The way you look at something, examine it, turn it over and over. The way you take things apart and break them down to see how they really are and how they work. All the while, just looking. Seeing. Honestly and purely, without judgment or criticism. It’s just amazing to me. Your body is a work of art. Flawless skin. Luminescent eyes. Infectious smile and laugh. And those locks! I could bury my nose in them til the day I die. I’d walk a thousand miles just to rub your back, run my fingers through your hair, or feel your tender kiss on my rough cheek. Every cell is a miracle, and a delight to behold. But by far, what I love about you most is your heart. Your very soul. Your kindness. Your gentility. Your sense of humor. But most of all I am in awe of your capacity to forgive. Even when I know you’re hurting, you are the purest, most loving person I have ever known. And your forgiveness, quick and unflinching, has gotten me through those low times when I fall into self-pity and think that I’m not good enough to deserve you. And so this Valentine’s Day I want you to know that you are the greatest love I have ever known, and will ever know. You are truly a gift from God. I am humbled, grateful and unworthy to have you in my life. You are my reason, BooBoo. You are the love of my life. Happy, Joyful Valentine’s Day, Robbie. Every love story has a file in my heart; ready to be pulled out when I need a sweet memory or the reminder of an important lesson. Your file is there too, yellow with age, crumply and dusty, fighting for its rightful space among the others. How could it not be? You are the oldest story in my heart. You are the one by which all others were compared. Fourteen, we were, on that day when both of us, for the first time, had a valentine. The courtship had lasted years; we evolved from childhood friends to homework buddies to, finally, sweethearts. You confessed your love for me over the phone, and I responded the next day when I held your hand secretly during lunch. Suddenly, without our realizing it, we were imprinted in each other’s histories. First love planted its seed, and the people we would become, eternally hopeful for the purest of loves, were formed. I have been given caramel-filled truffles, serenading cards, perfumed roses, and sparkling blue bracelets by scores of men more experienced in love and more schooled in romance than you. That was all I needed, a little place guaranteed in the heart of the boy I loved. That is all I have ever needed since. Our story, as you know, did not turn out to be a romantic comedy. There was no happily ever after for us. Although our first sparks were angelic in their purity and indisputable in their power, they belonged to the teenagers we once were, and did not have a place in the lives of the adults we became. But, my darling boy, your place in my heart is safe. A sacred spot – the first spot I ever gave away – rest assured that no amount of new files can diminish it. I hope, with all of my heart, that you feel loved on this day. I hope you are able to give to the right woman what you once gave me; a place in your heart. Happy Valentine’s Day, to you, my first Valentine. You changed my life the moment we met. I remember when I first laid eyes on you, from across a crowded big box retail store. You looked dazzling in the light, slim and pretty. And smart, too. The first time I held you I knew I had to bring you home, and once we got in the car I wasted no time peeling away your outer garments. How good it felt to caress your smooth body. I must have been doing something right because you positively lit up when I pressed your buttons. I played with you for hours that evening, and you gave me everything I desired. Sometimes I feel you tremble in my hand … or, if we’re being coy, down in my pocket. You’re the last thing I see before closing my eyes at night, and every morning you wake me with a sweet melody. Best of all, you never play games. Unless I’m in the mood, in which case we have been known to role play. You are everything I ever wanted; dare I say it? I love you, my HTC Evo 4G. It’s not that I want to neglect you, Valentine’s Day. It’s just that I love the day after Valentine’s Day more. And we will get to the why in a moment. I’ve never been much of a Valentine’s Day kind of girl. It always seemed so forced and contrived, and well … Hallmark-esque. I always appreciated the little random thoughtful things boyfriends have done for me rather than them feeling like they had to do something for me because it was Valentine’s Day. Throughout my marriage, my ex-husband and I would get each other Valentine’s Day gifts here or there. He would always bring me flowers, and had even gotten me an unbelievable bracelet the year my son was born. I couldn’t appreciate it really because I was nearly nine months pregnant and the thought of wearing anything other than one of his T-shirts didn’t appeal to me in any way. But it was sweet, and at the time, I told him totally unnecessary. After all, I explained, this was a fake holiday. On Valentine’s Day, strictly because I felt pressure to acknowledge it, I would leave little notes for him on the bathroom mirror for him to discover on his way to work and would get him a token gift, but it really ended there. I would much rather surprise him with little gifts on days he wasn’t expecting it, just as he did me. One of my boyfriends after my divorce took Valentine’s Day very seriously. He bought me a Chanel bag (I am lucky in the gift arena sometimes) and sent me two hundred roses. He was a bit over the top in a crazy what-the-f-but-I-will-take-it kind of way. He also made reservations at one of those pre-fixe dinners at a fancy restaurant. We showed up for the “first seating.” There were two. There is something about having to rush out for the next party that feels very unromantic to begin with. The restaurant was filled with red balloons and awkward couples drinking champagne. I cringed at the idea of us even being there. Nothing to do with him, but it felt so uncomfortable. I would look to the left to see couples holding hands, look to the right to see couples gazing into each other’s eyes … all because the scene was set. For Valentine’s Day. It felt like a mix between speed dating and a bad episode of The Love Boat. Where the boat may or may not have been sinking. It’s not that I am trying to rain on anyone’s love parade; it’s just that love should be celebrated every day. Not just because the proverbial they say it has to be. I personally, would rather flowers show up for no reason than because my man feels forced to send them. However, there is one thing I do like about Valentine’s Day. Chocolate. You know in movies, where people get those enormous hearts with 200 pieces of chocolate in them for Valentine’s Day. I never saw those in real life. Where do they sell them? But the only thing I love more than chocolate on Valentine’s Day … is chocolate the day after Valentine’s Day. Why, you ask? Because the same box of chocolate that was $50 is now on a sale rack for $5. And I like that. In fact, that is my favorite part of Valentine’s Day. 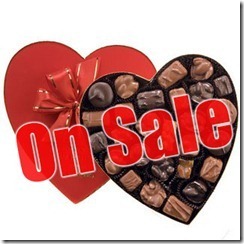 So to the day after Valentine Day chocolate sale … I love you. You complete me. So if you are feeling blue, like you have no one to share this Valentine’s Day with, don’t worry. You can share it with the cashier at CVS or Walgreens, or Godiva or anywhere that you can buy some “I love you” chocolate. And go eat it. At half the price! I don’t know you. You don’t know me. Actually, we haven’t even met yet. But when that time finally comes we will both know it was well worth the wait. I know you’re out there somewhere. When life decides our paths should finally cross we will know we were meant for each other the moment our eyes meet. Our bond will be instant, a friendship forever. You will know a life filled with love, laughter, playfulness, and joy. You will know no better home than the one we share together. I will care for you better than any other person and will show you the same loyalty as you will inevitably show me. You are the Odie to my Jon. The Zero to my Jack. The Snoopy to my Charlie Brown. The Scooby to my Shaggy. You will be my dog. And I will not be your master but your best friend. Here we are, after 10 years of such a loving relationship – isn’t it crazy – that it always comes around, back to you? There’s something about you. But hey, who says I can’t be free, from all of the things that I used to be? Sometimes, it seems like all we ever do is say goodbye, but let’s move it along, and that’s the way this wheel keeps workin’ out. I never want to stop this train, because you’ve got my only heart, and you can call what’s ours whatever you want to, but I’m calling it love soon. I can tell you one thing is for sure: good love is on the way. And so, February, won’t you be my Valentine? Thanks for choosing me over all the others (Jennifer Love Hewitt, Taylor Swift, Kim Kardashian, Jessica Simpson, Jennifer Anniston …) but would you want me when I’m not myself? John, you’re the brightest thing I’ve got, and this morning, there’s a calm I can’t explain. The rock candy’s melted, only diamonds now remain. First, I want to say how amazing the past year has been. I know you’ve recently come into your own as a big famous movie star, but I want to say thank you for remaining a hot piece of ace. I also wanted to say that I appreciated you taking your clothes off in Crazy, Stupid, Love this year – It was an amazing reminder as to why I love you so. Your performance in Drive was uncanny, even though you said so little while looking smoldering hot, I couldn’t help but be turned on while watching you drive fast and beat the crap out of bad guys. You are the yummy in my tummy! I know that we have had our ups and downs, but I must say again how truly sorry I am that you had to find out about my past with George Clooney on the set of Ides of March. I’m happy we were able to work through it, and our relationship is so much stronger today because of it. I also want you to know that because our love is so pure I am ignoring this whole Eva Mendes thing, this too shall pass. Sometimes we have to go off our beaten path to realize why the path was put there in the first place. I’ll see you soon great love of mine, I’ll see you soon. These last two valentines are by Lucky and Gizzy from Cocktails at Tiffany’s who are planning out their fairytale weddings to A-list celebrities on their new blog. It’s a once-in-a-lifetime event, so be there to witness the planning, the parties, and of course, the drama. I hope that you enjoyed this compilation of untraditional valentines. If you had to write an nontraditional valentine (ie, a valentine for anyone but your significant other), who would you write it to? Happy Valentine’s Day! I love this! I am now inspired and I am going to see if I can come up with my own untraditional Valentine to write. So glad you enjoyed it! 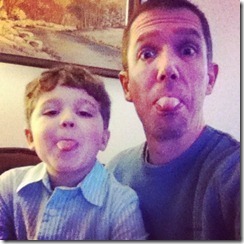 I’ve been a little out of the loop the past month or so – did you write one? Again, excellent idea Catherine. Thanks for bringing all of us writers together to bring various reasons of joy to others and remind everyone that Valentine’s Day isn’t just a day for lovers but a general day of love…applied to any person, place, thing or idea that our heart desires. Bravo! Well done! Looks like Cupid shot that arrow of his into quite the diverse crowd this year. I love this Catherine! They are all awesome, thanks for inviting me to be part of it, I’m so honored to be here!!! xoxoxooxox and Happy Valentine’s Day! So I totally teared up after the first one, so beautiful! Thanks for this, it does put today into perspective And that it’s not all about the lovey dovey type of love. Thanks for inviting us to do this Catherine, we really enjoyed it, and as always love being in good company with all these other amazing writers! No problem, thanks for participating! You should send your letters to your valentines… it would be fun if you got a response from some publicist. Haha! The one about day after valentine’s day was my absolute fav!! mmmmm!! Besides, chocolate just seems to taste better when you buy it for your self for super cheap, rather than receiving it from some awkward date who felt obligated to give it to you! Hey Lisa! Took me forever to reply (sorry). Still eating chocolate? Haha. Glad you enjoyed the post. Hi Amelie! Sorry – just seeing this. Valentine’s Day was wonderful! Chef got me flowers, a card and took me out a really nice dinner….then the next day, made me a really nice dinner at home. I’m a lucky lady! How was yours?